1 cent per click are back now in action !!! Wow ! A great deal for all online marketers, affiliate marketers and webmasters who is looking for a best way to get more traffic to their website or blog or landing page. Do you want to know the secret that I use to get 46K + targeted traffic visitors to my website, just by spending 1 cent per click/visitors. No-where we can get targeted traffic for 1 cent per visitors. It can only be done in bots and softwares, which is useless. When Bing and google adwords may work in a similar way, they are dont offer for 1 cent per click. But this secret revealing gig can offer you the same - the magic to get unlimited visitors in the cost of 1 cent per click. I hear you saying, stop this and let me know the secret [smiley] . Here you go !!! 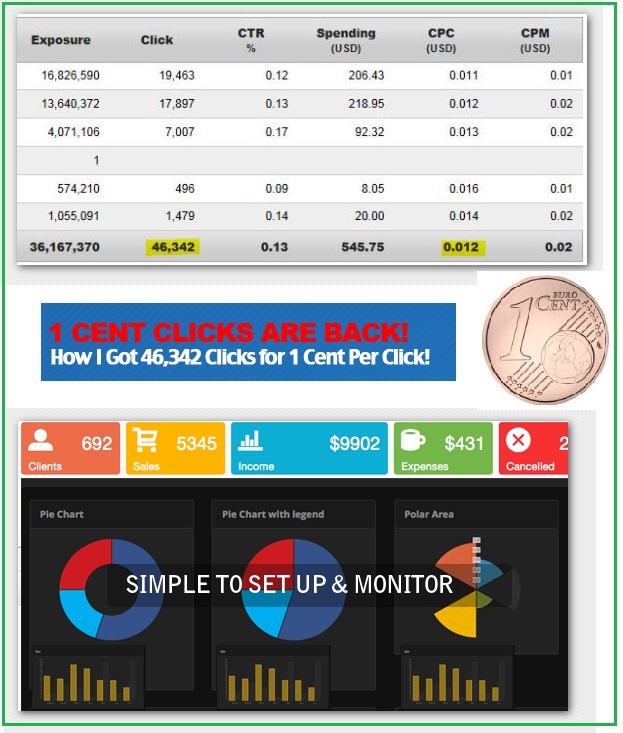 Allows you to target all the buying countries like UK, USA & Europe and STILL get 1 cent clicks! Step 3: Enjoy Unlimited 1 Cent Per Click Traffic! Easy, follow along training videos showing how we get unbelievable results from all our online campaings; insights and proven tips to ensure you are really paying a few cents for maximum results! We drive outrageous amounts of traffic to our websites, using the same methods outlined in this software. It is proven, cost-effective and delivers every time! OK, So You're Ready For One Cent Per Click Traffic? Buy this gig now to get the secret revealed. you're one step away from getting this unlimited traffic source! Question: Is this Facebook Ads? Answer: NO! Note: You are not buying PPC traffic from us. This product shows you how to get PPC Traffic for cents via our unique online video training content. * Update: When the original price is $49, We are still accepting SEO Clerks buyers for the discounted price of $37.00. Fully Supported. This gig sale comes with full support from our Members Area Team. You will be given with a client area and contact details of our support team. They are ready to help you with any issues or questions you have. Standing by to see you succeed right now! We appreciate your business as always !! Let us go far together !! We appreciate your business as always ! !